St. Nicholas Church Hosts Annual Faithful Servants Banquet for Holy Trinity Academy and Preschool. 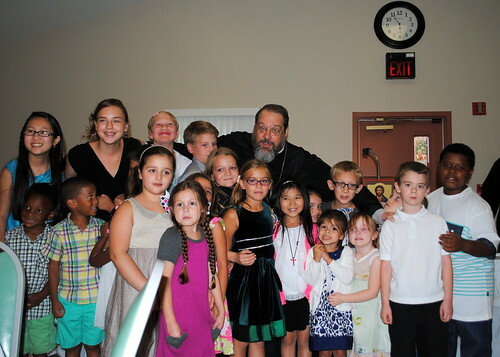 His Grace, Bishop Gregory was the guest of honor, and keynote speaker at the Holy Trinity Orthodox Christian Academy and Preschool Annual Faithful Servants Banquet held at St. Nicholas Orthodox Church in Warren, Ohio. The delicious dinner was donated and prepared by the good people of the St. Nicholas Society. Thank you to everyone who participated, attended and served at this event. All proceeds went to benefit the mission of Holy Trinity Academy. Click here to see the photo gallery of Bishop Gregory's Visit to Holy Trinity Academy on Sept 28, 2015. Bishop Gregory taking a picture with attending Holy Trinity students.